Today we are excited to catch up with our friend Carlos Patiño! Carlos is the author and illustrator of the famous vegan children’s book “Dave Love’s Chickens” and illustrator of Vegan Publisher’s newly released “Lena of Vegitopia and the Mystery of the Missing Animals.” Carlos talks about his creative process and let’s us know what he’s been up to this past year. Today we are pleased to feature an interview with vegan athlete Mac Danzig. An accomplished Mixed Martial Arts (MMA) competitor, Danzig talks about what inspires him, his decision to go vegan and how it impacted his athletic career and even gives us a recipe for his favorite post-workout smoothie. Can you guess the most common question he gets asked from non-vegans about being a vegan athlete? We are so excited to have had the chance to interview the amazing and inspiring couple that is Running Raw Around Australia. Throughout the year 2013, to inspire and motivate conscious lifestyle choices, to promote kindness and compassion for all living beings, and to raise environmental awareness for a sustainable future, veteran raw vegan runners Janette Murray-Wakelin (64) and Alan Murray (68) ran together around Australia 15,782km, 366 marathons in 366 days. They finished running 365 marathons in 365 days in Melbourne December 31, 2013. On January 1, 2014 they ran one more marathon #366 from Melbourne to Warrandyte along the Yarra Trail to set a new World Record for the most consecutive marathons. Today we are happy to welcome Kayle Martin of Cowgirls & Collard Greens. Learn how Kayle beat cancer with the help of a pure vegan diet, positive attitude and a pair of kickass cowgirl boots! 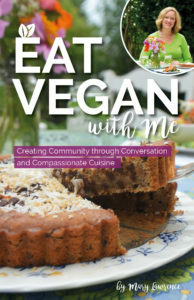 Today we welcome Sarah Louise Foster, the face behind The Cozy Vegan- a blog that offers recipes to warm your vegan cockles and aims to encourage compassion and activism through the food that we eat. Sarah offers some great tips for keeping it vegan this holiday season and check out her awesome recipe for Cozy Vegan Gingersnaps. David Simon, author of “Meatonomics: How the Rigged Economics of Meat and Dairy Make You Consume Too Much- and How to Eat Better, Live Longer, and Spend Smarter,” shines a light on the unsettling world of factory farming in America and how our own government contributes to it. Who doesn’t love a great vegan chocolate dessert? Today we bring you your chocolate fix in the form of a recipe from Fran Costigan, Queen of Vegan Desserts. This one might even be too good to share.